In the business of water and wastewater, there’s nothing more satisfying than doing the job right and having someone notice. The U.S. Environmental Protection Agency, the Water Environment Federation, and the Partnership for Safe Water have recognized more than 50 facilities over the last eight months. They applaud the good work that can be found in the industry. Water & Wastewater News has surveyed the winning field and showcases some of those plants that seem to have taken chances and stretched the limits of their resources. • Sturgis Wastewater Treatment Facility of Sturgis, S.D. • Alfred M. Smith Water Treatment Plant of the Southern Nevada Water Authority (Nevada). Santa Clara Valley, Calif., came out on top for its stormwater management program. EPA for the first time presented water efficiency awards and WWN also recognizes the Southern Nevada Water Authority for its Water Smart program. Florida’s Water Reuse Program. In the government/ military category, EPA recognized Florida’s Water Reuse Program as a Water Efficiency Leader (WEL). As of 2005, 41 percent of all wastewater in Florida was treated for reuse. The state’s program includes state regulations, public outreach, and reuse feasibility studies. In Florida, 465 water reclamation facilities provide about 660 million gallons per day (mgd) of reclaimed water for beneficial uses, including irrigation of more than 201,000 residential lawns, 462 golf courses, 572 parks, and 251 schools. “We are honored to receive one of the first WEL Awards,” said David York, the Department of Environmental Protection’s water reuse coordinator. He explained that the program is a collaborative effort among the state regulatory agency, five water management districts, the state department of health, the Public Service Commission, and several other state agencies. Reuse is an integral part of water resources management, wastewater management, and ecosystem management in Florida. The City of Fresno’s Industrial Pretreatment Program, Fresno, Calif. Fresno receives industrial wastewater from more than 21 significant industrial users. Its municipal pretreatment program has made significant strides toward compliance: over the course of 15 years, compliance increased from 65 percent to 91 percent. EPA honored the city for reducing industrial pollutants and protecting beneficial uses of reclaimed products. The city nominates hardworking regulated facilities for awards and sponsors its own awards as well as coordinates public information campaigns. The Wastewater Management Division operates the pretreatment program. This is a joint effort between the city and industries to control the levels of industrial contaminants entering the sewer system by permitting, inspections, monitoring, and enforcement of industries using the Regional Water Reclamation Facility services. At the same time, the program increases reclamation options (treatment and reuse) for the effluent and biosolids resulting from the wastewater treatment process. The industrial/commercial component of the wastewater flow has been estimated to be approximately 15 percent of total flow. The Wastewater Management Division is tasked as the enforcement authority for the pretreatment program. Regulations are enforced through actions that could escalate from simple warning notices to cease-and-desist orders if discharges constitute a public health and safety issue. Compliance through pollution prevention measures instead of enforcement actions is highly preferred. Increasing facility inspections has played an active role in improving communication with industries and the overall compliance rate in the last five years. Watertown Wastewater Treatment Facility, Watertown, S.D. This city’s wastewater division has televised its entire collection system to rank repair and replacement priorities, annually jets parts of the sanitary sewer system, and has taken an aggressive approach toward operations, maintenance, and financing. Castleton Wastewater Treatment Facility, Castleton, Vt. EPA honored this facility for maintaining an average 97 percent to 99 percent removal of biochemical oxygen demand and total suspended solids, in-house manufacture of fixtures for grinder pump canisters, and virtually no overflows or backups. A biosolids program meets or exceeds all requirements of its residuals management certification. Rock Creek Advanced Wastewater Treatment Facility, Hillsboro, Ore. This facility won EPA’s first-place award for excellence in operations and maintenance in the large, advanced treatment plant category. Rock Creek has adopted an improved phosphorus removal process using a combination of biological, chemical, and physical processes. The new process removes 85 percent to 95 percent of soluble phosphorus and has saved more than $100,000 in annual operating costs. It also has reduced the amount of alum added to the wastewater, which reduces aluminum and its salts into the biosolids and also dissolved solids in the cleaned wastewater. Rock Creek is part of the Clean Water Services special service district that works with seven member cities. It began operation in 1978. “They know what they are doing. Our facility is well operated and well maintained. Our staff takes a lot of pride in their work,” he commented. The Rock Creek facility staff includes 12 operators, some of whom have been with the facility for 31 years. “Some of them have had the benefit of seeing a lot of it built,” Stow said. From 1995 to 2005, Rock Creek has made changes to its facility by adding anaerobic digesters, a dewatering building, four belt presses, covered clarifiers, new raw sewage pumps, improved odor control equipment, aeration basins/secondary clarifier, and new head works. It also has expanded its tertiary gravity filtration system. Stow said the facility will be adding another secondary clarifier and is updating its facility plan. A blueprint for the next 20 years, the plan will help Rock Creek determine what changes need to be made and when. For example, certain levels of flow and load will trigger actions to better serve the facility’s customers. “We want to build in manageable chunks,” Stow explained. The Rock Creek facility provides wastewater treatment for Hillsboro, portions of Beaverton, Aloha, and unincorporated Washington County. The treated wastewater is discharged to the Tualatin River. The Rock Creek facility provides advanced treatment, including phosphorous and ammonia-nitrogen nutrient removal, and effluent filtration. Rock Creek provides Level IV effluent for irrigation water for public application. Biosolids streams from the Hillsboro and Forest Grove facilities as well as a portion of these plants’ influent flow are treated at Rock Creek. Biosolids are digested, processed, and dewatered at the facility. These biosolids are then land-applied. The strength of Rock Creek can be found in its staff, well-designed facilities, good support, and help from the collection and source control personnel, Stow said. “It’s a real team effort.” The facility also was recognized for its eight-module training program for new operator trainees, and the Safety Silver Dollar reward program for safety on the job. Wanatah Wastewater Treatment Facility, Wanatah, Ind. Only two full-time employees operate this first-place, EPA award recipient for excellence in operations and maintenance. Wanatah has a population of about 1,200 people; its wastewater treatment plant and collection system were installed in the early 1990s. Chuck Mack is public works superintendent and oversees operations of the town’s water and wastewater treatment facility. He works with Charles Jonas, water superintendent, who was hired in 1995. The facility, which treats about 73,000 gallons of wastewater per day, is contained by a post frame enclosure, which allows operations and maintenance to be conducted indoors. Approximately 5 percent of the flow comes from industrial sources. According to EPA Region V, which originally nominated the facility, the plant does an outstanding job of pollutant removal, consistently removing 99 percent of the biochemical oxygen demand and 97 percent of the suspended solids from the incoming wastewater. Major treatment processes include preliminary treatment, biological treatment by means of activated sludge, final clarification, ultraviolet disinfection, and post-aeration prior to discharge to Slocum Ditch, a tributary of the Kankakee River. Sludge is aerobically digested and further stabilized/ dewatered in reed beds. The award also notes achievements in the facility’s programs for laboratory control and sludge management. Mack said that as soon as the facility was completed, “I immediately began cross-training in the operations of the public water system, and all employees since then have been cross-trained in both utility operations.” Mack and Jonas are licensed to operate both facilities as well as the collection distribution systems. “I believe our facility’s success in winning the EPA award is the sum of many parts—employee dedication and longevity, cross-training, problem- solving, and a well-designed wastewater treatment facility,” Mack said. Sturgis Wastewater Treatment Facility, Sturgis, S.D. EPA named the Sturgis Wastewater Treatment Facility first in the category of large, nondischarging plant. Randy Nohava, Sturgis public works director of seven years, explained that the town’s lagoon system processes an average of 450,000 gallons per day. The all-gravity flow system sends wastewater to the aeration pond first, then to the second pond where it sits for 180 days, and finally to the third and fourth ponds where the water is connected to piping for local farming irrigation. Treated wastewater from the ponds is used to irrigate about 240 acres, mainly for haying purposes. In the first week of August, the town of 6,470 turns into a serious population of about 400,000 bikers and biker fans who come to the annual Sturgis Motorcycle Rally. The city has a contract with a portable toilet company, which brings in about 110 units. The average daily load on the wastewater treatment system increases to just under 1 million gallons per day, Nohava explained. This facility is unique because it manages this annual increase with natural wastewater treatment and gravity flow. The city also has minimized infiltration/inflow and encourages employees to remain on the job by pro-viding rewards. Nohava has worked for the city for 21 years. Safe water The Partnership for Safe Water is sponsored by the American Water Works Association, the Association of Metropolitan Water Agencies, the Association of State Drinking Water Administrators, EPA, the National Association of Water Companies, and the American Water Works Association Research Foundation. The partnership is a voluntary initiative to optimize treatment processes. To win the Directors Award, water systems must complete an application and a four-step self-assessment. Then they must undergo a peer-review phase, which examines their plant’s operational and administrative capabilities. Thirty-six other utilities/water treatment plants received Phase III Directors Awards in 2007. At the Peter L. Jacob plant, water from Lake Champlain’s Shelburne Bay undergoes pre-oxidation and prechlorine treatment, coagulation/ flocculation/prefiltration, primary and secondary disinfection, corrosion control, and fluoridation. The plant treats an average of 10 million gallons per day (mgd). Mike Barsotti, director of water quality and production, has been working at the facility for about 15 years. He and his team of nine operators run the facility and the storage and transmission system and monitor compliance with the combined distribution system. The plant has completed several improvement projects outlined in its 20-year master plan, including construction plans for a redundant source water intake, a switch to monochloramines to meet disinfection byproducts regulations, and a SCADA upgrade for monitoring and control of process and transmission/ storage. • modify secondary disinfection using monochloramines. In the nation, the plant was first to retrofit to full-scale adsorption clarification pretreatment technology and obtain the “Excellence in Water Treatment” award under the Partnership for Safe Water. The Nottingham plant, which serves the eastern part of Cleveland and its southeastern suburbs, began operation in 1951. The plant pumps directly into three service districts. It uses conventional processes—chemical addition, mixing, coagulation, flocculation, sedimentation, filtration, and disinfection. Plant Manager Sam Feinberg said that last year’s improvements and EPA approval will increase the facility’s capacity from 103 mgd to 125 mgd. On average, the plant produces 65 to 70 million gallons of water a day. “The success of [Nottingham] can be attributed to not only the financial investment that the city of Cleveland has made, but the support and dedication of Cleveland Water Department support managers and their staff and the knowledgeable and dedicated employees and professional management,” said Feinberg. The plant operations are manned 24/7 by 14 operators and four managers. From its facilities plan, the Nottingham plant made improvements in 2006 by installing new sedimentation basin collectors, a standby generator system, and a backwash clarifier. Ongoing projects include a new administration building and automation of the pumping process operation. The facility plans to rehabilitate its raw water pump and reservoir by 2010. Beginning operation in 1971, the Alfred Merritt Smith Water Treatment Facility treats most of Las Vegas Valley’s drinking water. The plant is located on the shores of Lake Mead, which provides its source water. Recent improvements to the facility increased the plant’s reliability and capacity. The facility can treat up to 600 mgd. 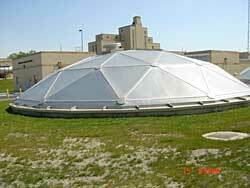 The addition of ozone treatment in 2003 put the facility on the cutting-edge of water treatment technology. Part of meeting that mission was adopting ozonation for disinfection. Johnson admitted that ozonation is expensive, but “the primary cost is installation,” he said, adding that ozonation operating costs are comparable to other disinfections methods. The technology has given the plant better taste and odor control and declines in disinfection byproducts and solids loading. While Johnson came to the water field two years ago from chemical manufacturing, he noted that some of the staff have been working at the plant for more than 30 years. The plant operates 24/7 with 16 staff members, and its processes are completely SCADA driven, Johnson explained. The plant currently is working on installing a new intake pumping station at a lower elevation of the lake. Water levels are dropping due to the drought, Johnson said, adding that also is the reason the facility is exploring groundwater resources from counties north of the valley. Santa Clara Valley Urban Runoff Pollution Prevention Program, Santa Clara County, Calif.
EPA bestowed first-place honors on Santa Clara Valley’s pollution prevention program for stormwater management. The nation’s first municipal separate stormwater system (MS4) permittee, the Santa Clara County program manages pollutants of concern, virtually eliminates mercury, tracks pesticide use, and mitigates effects of new development. The Santa Clara Valley Urban Runoff Pollution Prevention Program is an association of 13 cities and towns in the Santa Clara Valley, together with Santa Clara County and the Santa Clara Valley Water District. Program partici-pants share a common permit to discharge stormwater to South San Francisco Bay. To reduce pollution in urban runoff to the “maximum extent practicable,” the program incorporates regulatory, monitoring, and outreach measures aimed at improving the water quality of South San Francisco Bay and the streams of the Santa Clara Valley. New in 2006, the Water Efficiency Leader awards recognize those that provide leadership and innovation in water-efficient products and practices. The program enables EPA to document “best management practices,” among other things. In the utilities/water districts category, Southern Nevada Water Authority’s Water Smart Program captured the attention of EPA. This program has saved more than 20 billion gallons of water a year since 2002. The program includes waterefficient landscaping, new home developments, private sector partnerships with landscape, pool, and car wash industries; rebates for smart irrigation controllers, and an annual trade event promoting innovation in products and practices. Innovation and common sense came together in the Northwest Center for Engineering Science and Technologies’ Maseeh College of Engineering and Computer Science at Portland State University. Not a plant in the typical sense, the center is a gold-certified Leadership in Energy and Environmental Design building that also serves as a water-efficient model for engineering students. The center has a rainwater harvesting system, stormwater filtering systems, and geothermal heating and cooling from underground springs. The rainwater harvesting system uses Oregon’s average 38 inches of annual rainfall to supplement the building’s overall water demand. The system captures rain from approximately half of the rooftop area and diverts a portion through the rainwater harvesting system located in the hydrology lab on the second floor. Water is stored in a 1,000-gallon tank, filtered through three separate steps, and undergoes ultraviolet sterilization and chlorination before being pumped to toilets and urinals on the first floor. In addition to conserving drinking water and reducing rainwater runoff, this system contributes to the university’s engineering curriculum. Students will use the rainwater harvesting system to study water usage rates, rain water quality, filtration methods, and other aspects of environmental engineering in an effort to advance this technology.